For several months now, Exit has been trying to find out the precise legal status of the “legal opinion” drafted by EURALIUS IV concerning the election of the Temporary Prosecutor. This opinion was used by the Albanian government as an argument to unconstitutionally elect Shkodra prosecutor Arta Marku as Temporary General Prosecutor. The legal opinion was allegedly solicited by PS deputy Ulsi Manja, the chair of the Legal Affairs Committee of Parliament, and arrived at his office on November 13, 2017 and received protocol number 2836. The opinion was accompanied by a letter with EURALIUS letterhead, co-signed by both EURALIUS Team Leader Agnes Bernhard and OPDAT Resident Legal Advisor Jon Smibert. The legal opinion itself was undated and unsigned. 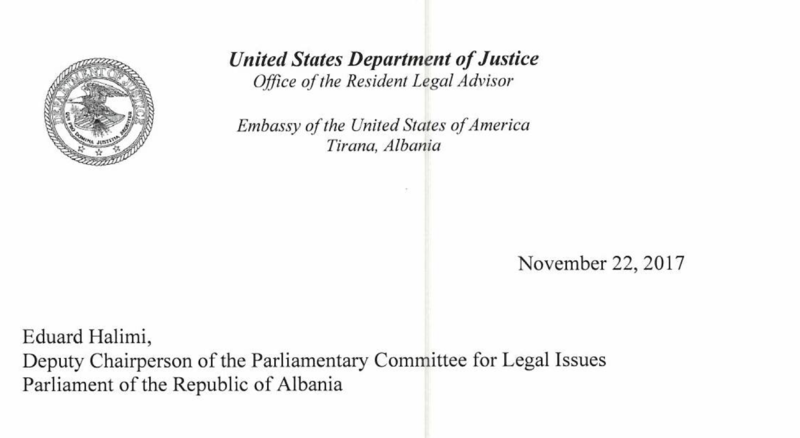 Another letter, this time on OPDAT letterhead, sent on November 22, 2017 to deputy chair of the Legal Affairs Committee, PD deputy Eduard Halimi is signed only by Smibert and contains the same legal opinion. 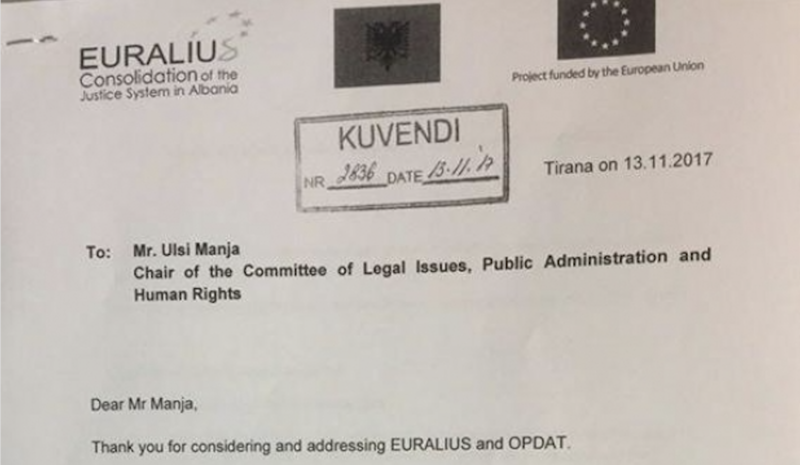 It therefore appears that Manja didn’t share the document he received on November 13 with his deputy chair from the opposition, who had to ask EURALIUS and OPDAT for it separately. The letter of November 22 appears to have received no protocol number from Parliament. Furthermore it is unclear why OPDAT, and not EURALIUS provided Halimi with a copy of the legal opinion, and why the letter was not co-signed by Bernhard. The situation becomes even more complicated after I recently received a reply to a freedom of information request to Parliament, requesting all communication between Parliament and EURALIUS. According to General Secretary Genci Gjonçaj, all recommendations of EURALIUS are available on their website – which, however, does not include the legal opinion received by Manja and Halimi on November 13 and 22 concerning the Temporary Prosecutor General. Furthermore, Gjonçaj refused to release the letter Manja has written to EURALIUS requesting the legal opinion. My inquiries to EURALIUS Team Leader Bernhard and her colleagues as to why the legal opinion has not been made available to the public have been ignored. Even though EURALIUS is a legal assistance mission funded with public money, it refuses to be accountable for its actions to those who pay for it. All of this may appear to be just an obsession, but the importance of this situation should not be underestimated. This has been a document – the only one of its type issued in three years by an international legal assistance mission – that has had far-reaching consequences. It has had a debilitating effect on the efficiency of the Prosecution Office and has led to a series of unconstitutional actions by Temporary Prosecutor General Marku. Moreover, it has seriously thrown in doubt the chances of a successful judicial reform and allowed the capture of the Prosecution Office by the government. This is all the more ironic, as the international diplomats supporting EURALIUS consistently point to “numerous attempts to derail or, at least, to delay the reform,” implying the opposition – they ought to be pointing at themselves. This document appears as a ghost: The European Commission denies it holds any information or documents on EURALIUS; EURALIUS refuses to respond to any inquiries from the press and Parliament denies to possess the document whose protocol number has been made public in the press. Everyone involved in this process seems to be keen to erase any memory of this unique legal opinion, but its tremendous consequences will be felt for a long time.